iDJ 2 Go Plus is the easiest way to become a DJ with your iPad, iPhone or iPod touch. The system harnesses the processing power of your iPad, iPhone, or iPod touch and enables you to DJ anywhere using the music from your iTunes library. 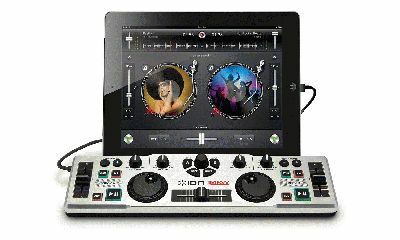 iDJ 2 Go Plus works with Algoriddim’s award-winning djay app (sold separately). With unprecedented ease-of-use and innovative multi-touch mixing features, djay for takes DJing on your iOS device to the next level. You’ll be able to mix, scratch and perform like a pro using iDJ 2 Go’s two scratch wheels, crossfader, and generous array of bright backlit buttons. Connect your iOS device in seconds using the built-in Lightning connector, and everything you need to mix is right in front of you. Experience your music like never before with iDJ 2 Go Plus from ION. Connects directly to iPad, iPhone, or iPod touch — no batteries required!